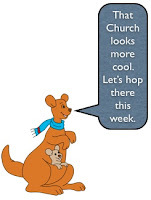 Hopping around for a church to fit in? Church shopping? Well, this article is for you. This week, I like to highlight seven ways how NOT to choose a Church. Hundreds, if not thousands of people church hop. I know of many who do so at various phases of their lives. Some move because of an unmet need in their own lives. Others move because of their children. Still, others move because they needed a break. Fair enough. Church is not for the faint-hearted. There are legitimate reasons why people church hop. There are also strange and selfish reasons too. This is partly due to the consumer culture we have, as well as the freedom of choice. In such a culture, our own priorities increasingly trump community needs. 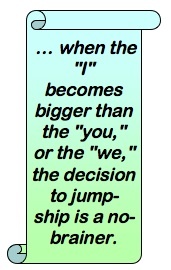 When the "I" becomes bigger than the "you," or the "we," the decision to jump-ship on the basis of self-need is a no-brainer. Before I go on, let me offer a piece of advice. This is for those of us who are looking for a "perfect church" to go to. If you eventually find one, do NOT join it. Stay away. Keep it separate from your influence. For if you do, you will make it imperfect. If in doubt, check out Romans 3:23. Such an advice will not go down well with those who are conceited and who have an overly high view of themselves. They may even accuse me of judgmentalism. Sigh. That's how life is. We have more problems of imperfect people trying to look perfect, thinking that the whole world owes them a living. I have been in Christian ministry for more than 27 years. I have seen people shop for the perfect church, often seeing another church as "better suited" to their liking than their existing one. Let me put together seven thoughts on how NOT to choose a Church. In our world of latest and the greatest technological gizmos, a higher version number of anything generally means a faster, better, and more improved version. From iPads to iPhones, from software version 1 to the next upgrade, whatever new and fresh almost always looks better. Most of the time, people who are attracted to the latest-and-the-greatest churches will tend to let the facade drives their decision making. Just because the Church uses the latest Powerpoint projector, or biggest sound system, does not necessarily mean it is better. Beware the danger of fascination with the idol of technology or the neo-ism (new things - ism). Not all new things are good. Neither are all old things bad. If we can learn to see new things with old, tried and tested wisdom, and old things with a fresh perspective, it augers well for all generations, both young and old. If your reason for joining a church is on the basis of new stuff, the latest and the greatest, do not join them. For if that is your criteria, all it takes is a brand new church next year to make you jump ship again. Beware: If we choose a Church on the basis of the latest-and-the-greatest, remember that we will eventually become obsolete, as the church becomes a victim of its own focus. This flows from the first point. Some churches are so full and excited about new things that they totally ignore the historical past or the traditions that have stood the test of time. It is one thing to embrace the new, it is yet another to do so at the expense of the past. A church that forgets about its past is erasing its own sense of identity. I have seen young people who get easily tired about their old traditional churches, and leave for supposedly "greener" pastures. After a while, they too grow tired of their adopted church. Worse, they have lost the opportunity to learn the wisdom and the tradition that have faithfully given the Church its very identity. The author George Santayana writes, "Those who cannot remember the past are condemned to repeat it." We need to let history be our guide for the future. Without a firm foundation of the past, how can one even how how to think or plan for the future? If the church you are considering, NEVER talks about their story, their history, or the traditions of the faith, do not join it. They are fast losing their sense of identity. If you join them, you too may lose your own sense of identity. Beware: A Church that never talks about its tradition or history is erasing its own sense of identity. In an individualistic society that is high on personal rights, it is common for society at large to accept that everyone has a right to their own views and opinions. This places the Church in a strange situation. On the one hand, individuals do have a right to their own opinion. What if they are wrong? What if the Church fails to speak out, just because they have to toe the line of "respecting" people's individual rights? Sometimes, people become so sensitive about comments on them that they are ready to go on the defensive everytime they find themselves questioned about anything. So everyone has a right to their own opinion, and no one dares to speak out. If you go to a Church that behaves exactly that way, that never ever question your behaviour, even when the behaviour is sinful and wrong, the Church is not living as the true Church. Beware: The Church that never questions you even when you are wrong, is not standing up for the truth. We live in an e-world. From TV to movies, from Internet apps to all kinds of social activities, entertainment is a way of life. Sometimes, we bring that expectation to church on Sundays. People come with expectations of a great worship time, a place honed for maximum experiential value, and of course, great sermons! I liken these things to spiritual steroids. They beef us up for a little while. After the effect wears off, like energy drinks, we become worn out after the kick factor is gone. If one chooses a Church on the basis of entertainment value, I will question what is the priority of the person attending church. Is worship for self or for God? Beware: A Church that is focused on mere entertainment has misappropriated their resources and misdirected the focus that belongs to God. Once, I heard a church member say this. "I'm leaving this church because this church does not meet my needs, or my family's needs." I shudder when I hear that. What? Is Church about meeting your needs? Are you not bringing in a consumerist mindset into the church of God? What happens if the new church you are going to, no longer "meets" your need? Does it mean you will hop on to the next church? Where then is your sense of calling? You may say you have a right to have your needs met. What about your responsibilities as a church member? Hey. In my years in Church, I cannot remember a time where the church fully meets my needs. That is not the purpose of church in the first place. If you want entertainment, turn on the TV. If you want babysitting, go get a babysitter. If you want good songs, hop onto to the Internet radio. Church is not for entertaining you. Church is us worshiping God. Together. Beware: A Church that meets all needs is never sustainable. After all, Church is not about meeting needs. It is about letting God meet needs, and as God leads, through people like you and me. Church is not a hospital. It is a place for worship. If one chooses a church simply because it puts openness above doctrinal truths, one may start to question whether it is a church or simply a spiritual club. In an age where many people espouses a form of spiritual-but-not-religious, it is tempting for churches to jump on the bandwagon of syncretism, where anything and everything goes. One reason why many people prefer spirituality instead of religion is because they do not want to be hemmed in any one view or religious position. They prefer an undefined idea of spirituality instead of a rigid persuasion of religion, so that they can be free to believe and to practise whatever they WANT to believe, without feeling judged by anyone, even God. The center of decision making is not truth. It is their own perception of truth. If one does not stand for anything, one essentially stands for nothing. If the Church you are about to attend is open to all kind of values, think again. Churches like these are interested in numbers and a false sense of openness. Beware: A Church that is totally open to everything stands for nothing. #7 - The Church never challenges me, and requires very little from me. It is easy to say nice things to one another, and feel like we are accepted. Did Jesus say nice things to all people he meets? Yes, he is compassionate. Yes, he is gentle. Yes, he speaks and shares lovingly with the poor, the weak, and the handicapped. Yet, he challenges the Pharisees, the Zealots, and the Sadduccees not to be hypocrites. He gives his disciples the challenge to love one another, to lay down their lives for each other, to deny themselves, take up the cross and to follow Jesus. He even tells Peter to brace himself for the worse. Dietrich Bonhoeffer warns us of cheap grace. Let me close by sharing an excerpt of his writings. Beware: A Church that offers cheap grace, does not challenge people to move beyond their comfort zone, is not living out its calling to be the true Church of Jesus Christ. If any of these seven reasons forms a big criteria in your choosing of a church, think again. For the sake of your family, think double. For the sake of yourself, think thrice. For the sake of the gospel, think. Well said! And it's consistent with Scripture and with my book, Changing Churches. I shared it on Facebook and Tweeted it. Thanks Dottie. I'll check out your book soon.